Robert died from wounds received whilst working with a party at Ypres, on the 22nd. October 1917. He was 24 years old. Robert Pierce Pritchard was born in Meliden during 1892 [his birth is registered at St Asaph, during the December quarter 1892. FreeBMD]. He was the son of Robert and Louisa Pritchard. The 1901 census records the family living in Parliament Street, Rhuddlan. His Father’s occupation is shown as “horseman on a Farm”. In addition to their son Robert, there is a younger daughter Lizzie, aged 6. The widowed Mother-in-law, Jane Jones aged 63 is also living with the family. The children are reported to be Welsh speaking. The 1911 census, records the family now living in a 3 room [including the kitchen] house, at 18 Cross Street, Rhuddlan. [Just round the corner from Parliament Street]. Lizzie is no longer at home and Mr Pritchard’s occupation is now “Plate-layer” on the Railway for the L&NWRCo. Robert, now aged 18 and single, was working at a Market Garden. That census shows, the family originally comprised three children, but only two were still alive at the time of the census. Robert does have a Flintshire Memorial Index Card at Hawarden Records Office, which gives his period of service as 1 year & 7months. His death was reported in the Rhyl Journal of 3rd November 1917, under the headline; “Two Rhuddlan lads make supreme sacrifice.” According to the report he died in hospital half an hour after being wounded by a shell burst. The newspaper recorded that he was an active member of the Baptist cause and had been a gardener in the employ of Mr James Maxwell at the time of enlistment. Having lost a child in infancy [1911 Census], then Robert to the war, further tragedy struck Mr & Mrs Pritchard, as their daughter Elizabeth [Lizzie] died in 1920 aged 25 years old [Family Headstone]. 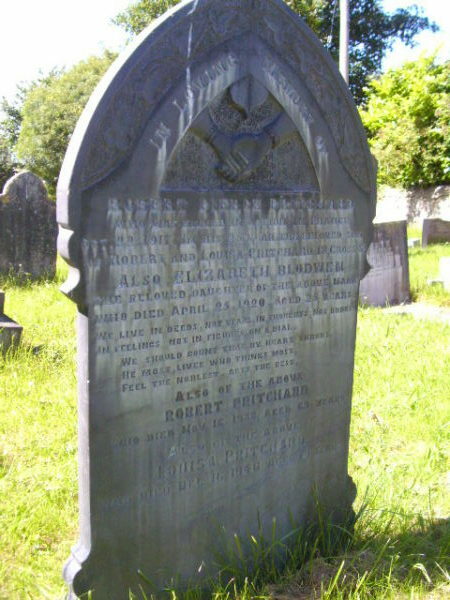 Family Headstone in Rhuddlan Churchyard. Robert is commemorated on the Rhuddlan Memorial, The Roll of Honour and Stained Glass Memorial in St Mary’s Church, The Royal British Legion’s Roll of Honour inside the Community Centre, and the North Wales Memorial Arch at Bangor. He is also commemorated on the family headstone in St Mary’s Churchyard. I am indebted to Sarah Hodnett of the Rhuddlan Local History Society, for her help in compiling this report.